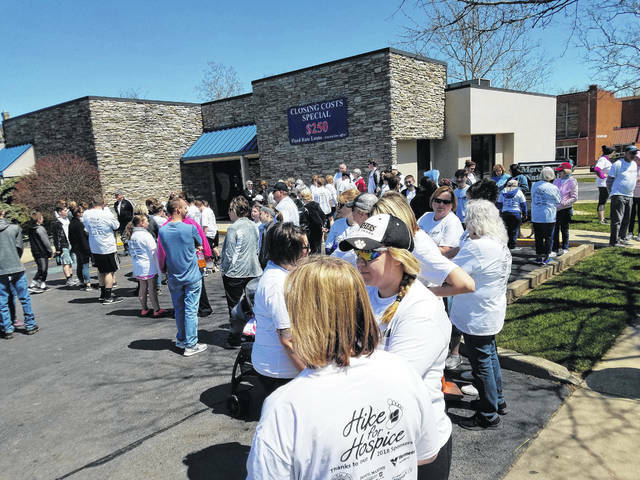 The annual Hike for Hospice to benefit Ohio’s Hospice of Fayette County is slated for Sunday, April 28. It will begin at 3 p.m. at Merchants National Bank, 128 S. North St., Washington Court House. Registration for the hike is $14 per adult and $10 per child. Teams that are preregistered by April 12 are provided with t-shirts. Those who do receive t-shirts are asked to wear them for the hike as there will be a group photo taken. T-shirts are not guaranteed after April 12. Included with the registration fee are pizza and drinks that will be provided after the event. There will be awards for the teams with the most adult hikers, the most youth hikers and the most money raised. There will also be awards for the individual who raised the most money and the individual who sold the most FEET. Everyone is welcome during the hike, and that includes runners, walkers, wagons, strollers and even pets (as long as they are on leashes). There are a few ways to register. Register online by visiting www.HospiceofFayetteCounty.org/Hike19. Register in person by going to or mailing a registration entry form to the Ohio’s Hospice of Fayette County office, located at 222 N. Oakland Ave., Washington Court House. The third way to register is by showing up at the event on April 28, but registration must be done before 2 p.m. T-shirts cannot be guaranteed for those who do not pre-register. There are Memory Walk Signs available to purchase for $6 to honor the memory of loved ones. These signs will be part of the hike and will be located near Grace Community Church. These fundraisers help to cover patient care and services that aren’t covered under those medical plans. The services they provide include end-of-life care, grief counseling and bereavement support. For questions or concerns, stop at the Ohio’s Hospice of Fayette County office or call them at 740-335-0149. Donations are also accepted and appreciated.